Septic Tanks were the accepted method for sewage disposal and wastewater treatment in rural areas until the 1980's. They are now only usually acceptable for populations of up to 15 people and only in certain areas. There are hundreds of thousands of septic tanks in the UK and from 1st January, 2015, they must all comply with the Environment Agency General Binding Rules. Septic Systems give a very crude method of treating sewage for properties which are not connected to mains drainage. Many septic tanks throughout the world are never maintained and so do not work properly and pollution control laws exist to try to limit the amount of environmental and health risks they cause. These laws are getting tighter, and minimum standards have been put in place for new or replacement septic tanks. Always get septic systems checked by a wastewater expert before purchasing a property to prevent a pollution problem. Most of our telephone calls are due to existing septic systems that no longer work. This can be due to faults and deteriorations in the tank, but nine times out of ten it is due to soakaway drainfield failure. All septic tank soakaways are doomed to fail sooner or later. When soakaways fail, it is catastrophic for the owner as the entire system backs up and they can no longer use the toilets, shower, etc without thinking of the amount of water that they are putting into an already overloaded system. The tank may even have to be emptied once a week, if the soakaway failure is advanced, at a cost of around £150 a time. The 'onion' shaped ones seem to cause soakaway failures quicker than the traditional 2 chamber tanks. Unfortunately, they are also cheaper, so tend to be more common. As we often say to people, "A house without sanitation is just a shed". Always have the system inspected prior to purchase of a property, but always budget for replacement of the system with a sewage treatment plant sometime in the future, as environmental regulations become tighter. Sewage treatment plant soakaways also do not tend to fail as the plants are far more efficient. Take a look at the webpages opposite for further information. Telephone us if you have any questions regarding any aspect of sewage treatment. You will receive completely impartial advice based on 25 years in the wastewater treatment industry. 'Onion' or Traditional shaped tank? How often should it be emptied? Can the septic tank accept roofwater? What about bleaches and detergents? There are various types of septic systems. They consist of an underground tank in differing shapes and sizes, which then connects to a secondary soil treatment system, usually a land drainage system in the form of a soakaway or drainfield, or a mound soakaway. Traditionally, they were made using brick, concrete or blocks. Modern ones are usually made of fibreglass in either the 'onion' or the vastly superior traditional, but more expensive to produce, two chamber design. Raw sewage and wastewater from baths, kitchens, etc. discharges into the septic tank, where the solids are separated from the liquid waste. Fats and oils float to the top and form a crust layer. Faeces and food scraps sink to the bottom and form a sludge layer. Anerobic bacteria which are natural colonisers in the tank "digest" this sludge by up to 70%. The dirty septic water flows to a soakaway or drainfield. Baffles or 'T' pipes in the tank hold back the floating crust and prevent it from entering the outlet. 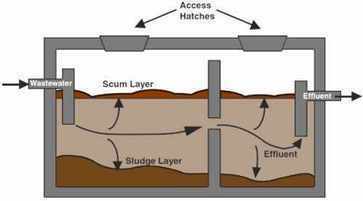 In order that the sludge and crust layers do not become too deep, septic tanks should be emptied annually. This also prevents a higher and higher concentration of suspended solids washing out into the soakaway. Solids can block the air spaces in the soil drainage system, creating a drainage problem and the effluent will not be able to soak away or be treated by the natural soil bacteria. Traditional septic tanks comprise of two rectangular chambers: the first one being 2/3 of the whole and the second 1/3, usually built in brick or concrete. Strict design rules are in place and septic tanks must be designed in accordance with BS 6297 1983. The inlet pipe into the first chamber ends in a 'T' pipe which travels down the at least 450mm (18") below top water level (TWL), and the chamber must be a minimum of 1200mm (4'-0") deep from TWL. This first stage chamber is usually twice as long as it is wide. The pipe from the first chamber into the second chamber consists of an 'H' pipe and the bottom of the pipe is a min. of 300mm (12") below TWL in the first chamber and 450mm (18") below top water level (TWL) when it enters the second chamber.This second stage chamber is usually square. The outlet pipe from the second chamber also consists of a 'T' pipe with the bottom of the pipe 300mm (12") below TWL. Visit our Crystal septic tank page. Vent pipes should be installed from the first and second chambers for venting the gases, mainly methane and hydrogen sulphide, produced by the sludge. Strong covers should always be placed completely over the tank to avoid children / animals falling in. There are many cases of septic tank covers collapsing and many people have been killed as a result. Onion or Traditional rectangular tanks? Nowadays, septic tanks are made in GRP and polyethylene which commonly are spherical in shape with a narrow shaft at the top to a manhole cover at ground level. These tanks do not produce the same quality of effluent as traditional brick, concrete or GRP two chamber tanks and cannot be placed in front of many septic tank conversion units, including the FilterPod and BioKube. Care should be taken to make sure that problems will not occur due to the tank rising out of the ground, when it is emptied in high water table sites. Also. if you simply surround it with gravel, then water will find its easiest route to soak away during heavy rain and the gravel will act as a french drain, flooding the area next to the tank and causing the same type of problem. It is always advisable to install the tank with a concrete surround, unless it is a Crystal which is so strong that it can be installed strapped down to a concrete base for ballast and backfilled with gravel. The Effluent still contains about 70% of the pollutants, including dangerous viruses and bacteria, in the original sewage. This needs further digestion by natural aerobic soil bacteria in the soakaway to prevent septic systems causing a pollution problem and contaminating the drinking water groundwater with E.Coli, Typhoid, etc. The alternative method for further treatment is to install a FILTERPOD or Vortex after the tank. The effluent can then be discharged to a watercourse or ditch.